To create the framework AMR examined hundreds of specialty manufacturing companies across a range of sub-sectors. 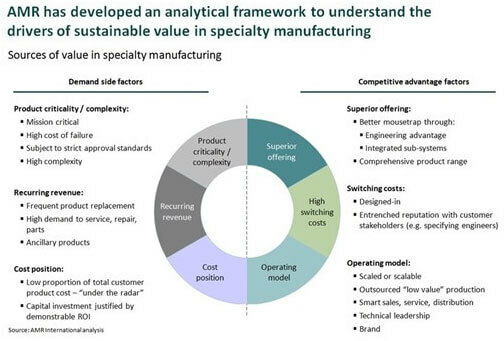 In 2012, AMR published its white paper “How to achieve sustainable value in specialty manufacturing”. Our purpose was to identify and assess the balance of factors that drive profitability and long term value in specialty manufacturing. We were determined to provide a structure within which widely used truisms such as the importance of superior products or recurring revenue could be structured in a practical way. To create the framework AMR examined hundreds of specialty manufacturing companies across a range of sub-sectors. We showed how strong value creation can be achieved through high exposure to a mix of defined demand side and competitive advantage criteria. 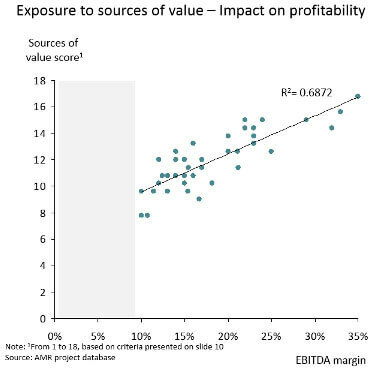 Our “Sources of Value” (SoV) framework was then devised based on this analysis. For 50+ projects we have used SoV to support our clients’ strategic growth initiatives. We have road tested this unique tool while further developing our specialty manufacturing database. Over this broadened experience we have found a constant correlation between the SoV factors and margin over time. AMR provided a group with a comprehensive assessment of the flow control market and an approach to develop its fledgling flow control division. Our SoV framework was used in two ways: 1) to show that the sector supports sustained value through positive long term growth and margin drivers, and 2) to define a series of structured filters which prioritised areas of opportunity for growth via acquisition. The result included potential roadmaps for a build-out platform, and a sustainable pipeline of attractive targets. AMR helped a global industrial company to assess the opportunities in an unfamiliar but adjacent market. Although some products at first appeared commoditized, our SoV analysis highlighted how value would continue to be sustainable in the wake of margin improvement from 23% to 29% over five years. Additionally, the framework provided a basis on which AMR could assess potential post-acquisition build-out strategies. AMR conducted a strategic review of the oil and gas, power generation and desalination market on behalf of a global engineering company. Our SoV analysis helped define how the existing business is currently positioned, and enabled identification of attractive (high growth, sustainable value) niche technology opportunities. The competition for attractive assets which drive sustained value remains high. AMR’s SoV analysis is a useful tool to use as a starting point. When combined with a deep understanding of the underlying market, customer needs and company positioning, the SoV framework becomes a powerful integrated approach. Working for over 25 years, AMR International is a boutique strategy consultancy focused on building strategies for sustainable growth. We firmly believe that strategy begins with customers (“customer-centric strategy approach”), and not just business theory or quarterly reporting. AMR provides insight and expertise to leading specialty manufacturing groups as well as strategic and commercial support to investors in the sector. We work closely with management teams operating within its specialist practice areas to help them achieve their goals through growth strategy, pricing or acquisitions. AMR has a dedicated practice covering specialty manufacturing across Europe, North America and Asia.